If you’re written a personal development book that helps a certain group of people overcome challenges in their personal, professional (or both) lives, and need a publisher, worry no more. 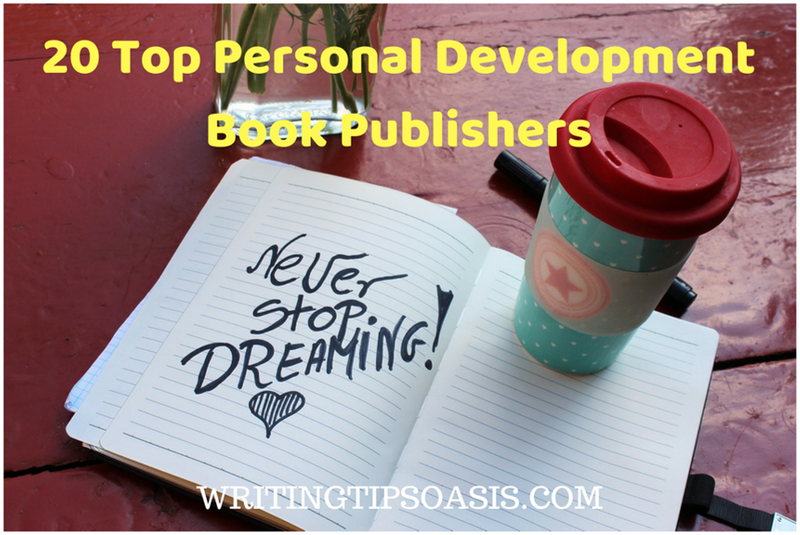 Below you’ll find a list 20 top personal development book publishers. We’ve included details about who each publisher is, the location of the publisher, the types of personal development books the organization publishes and how you can make a submission. Established in 1985 as a publisher of directories, Career Press is now a popular publisher of self-help, personal development, business and improvement books. With 1000 titles, it is the go-to publisher for books on career and business written by experienced, nuanced authors. Their philosophy has remained the same in nearly 30 years of business, to help readers all over the world enhance their professional lives. Based in Newburyport, Career Press expects its authors to use an engaging, funny style of writing to make it easy to be understood and read. They launched an imprint, New Page Books in 1999 for topics such as diet, health, science and self-help. You can send a book proposal by post or email after reading the guidelines mentioned here. The growing media industry means there is a growing need for advice for artists, creative geniuses, media professionals and writers. Allworth Press was launched in 1989 by Tad Crawford to provide useful, practical guidance and advice to photographers, artists, writers, content creators and anyone in media. From learning how to manage your blog to developing your photography skills, there is something for everybody. These books written by industry experts are essential for personal development and self-help. It has won awards in the publishing industry because of their extensive efforts to print good, saleable books that eventually become bestsellers. Allworth Press became an imprint of Skyhorse Publishing in 2011. Located in New York, they print 20-25 books annually. Writers of personal development or self-help in the fields of art, writing, content, photography, crafts, design and performing arts can submit their manuscript via email. The contact details and guidelines are listed on this page. Judy Galbraith formed Free Spirit Publishing in 1983 to reach out to children and teens in need. A teacher and gifted education specialist, she knew firsthand the lives of children and teens that are different and can’t find help when they require it. Parents and counselors also struggle because they are not aware how to deal with the emotions and feelings of the children. Free Spirit Publishing prints books about real issues faced by those children and teens such as depression, anxiety, sexual development, self-help and school. With over 300 titles to their name, they are situated in Minneapolis. Writers of personal development and self-help for kids or teens can consider submitting a manuscript to them. They do not publish personal development for adults. Read the submission guidelines carefully before sending them a proposal. A literary agent with 25 years of experience, Lori Perkins has led Riverdale Avenue Books to become an award winning full service publisher with 9 imprints. A writer and a professor as well, Lori knows a good book when she sees one and her various bestsellers are proof. The imprints of Riverdale cover all topics from fiction to erotica to self-help, memoirs, horror, science fiction and fantasy. They are currently seeking personal development or self-help books for Riverdale Magnus, their LGBTQ imprint. Writers should read the submission guidelines carefully before offering a book proposal. Starting as a regional publisher in 1979, Acadian House Publishing has become a leading name in non-fiction in USA. Based in Lafayette, they have printed and published bestselling books in history, sports, self-help, personal development, biographies, Louisiana culture and history. Written in simple but effective style, their books are engaging and provide the reader the tools for personal development and self-help. Whether it’s about career or parenting or faith, Acadian House has everything. You can send your book proposal via post after reading the extensive guidelines here. A small, independent press in Omaha, Addicus Books publishes only 5-10 books a year. The selective press prints non-fiction books in health, legal affairs, self-help, personal development and business. Written by industry leaders and professionals, these books are educative and informational. As a small press, Addicus can offer you personalized attention and the freedom to collaborate creatively in the process of book publishing. They have received glowing testimonials from their authors who have been an integral part of the design, marketing and editorial procedure of their books. Writers of personal development or self-help books can send a query by e-mail after reading their guidelines. Crown House Publishing is a specialist publisher printing books with an academic, researched perspective. Their books are aimed at consultants, professionals, common people and anybody who wants to better their life, health or mental state. Focusing on medicine, science and research backed books; authors at Crown House Publishing are expected to write in a concise, crisp style. Books about parenting, personal growth or self-development, improving health, business, child care and development are some of their preferred genres. You will have to send a detailed proposal along with an Author Questionnaire form, listing basic information about you. You can find the submission guidelines and contact details here. They accept proposals via email or post to their New York office. Established in 2012, Familius is dedicated to spreading stories about family, love and relationships. The founders, Christopher and Michele Robbins wanted to print positive, encouraging stories about being better families and people. Books about teens, parenting, self-help and personal development are something they do as well. In merely 6 years, the company in Sanger has published books and authors that share real, raw stories and writing with readers. They print in traditional and digital formats. Writers and authors of personal development can submit their book proposal using this form. Please read the submission guidelines carefully before sending your material. Located in Fresno, Quill Driver Books prints and publishes award winning non-fiction books in various genres. An imprint of Linden Publishing, they involve the author and writer in all stages from editing to designing, marketing and promoting. Interested in books that engage the reader using simple language and writing, they prefer books in self-help, history, culture, arts, education, entertainment, travel and lifestyle. They want writers who are aware about the current market trends, who their audience is and why their book might sell. This traditional publisher has extensive submission guidelines for authors and writers. You will also find helpful resources for crafting a book proposal listed on the link mentioned above. Betty and Bill Wright hit gold in 1979 with their first book, Child-Snatched by Margaret Strickland. Based on a true story, that book inspired their next bestseller How to Deal with a Parental Kidnapping. That started a career as a publisher of non-fiction, self-help books about laws, parenting, personal development, business, love, sports, health and lifestyle. Based in Highland City, this small press has won numerous awards for its ability to print efficient, inspirational books that alter the lives of readers. They are open to self-help and personal development books on any subject. You can find the submission guidelines and contact details listed here. This edgy and alternative publisher has a very clear mission- to print stories about different and marginalized people and places. Going further than a traditional publisher, Microcosm uses blogs, magazines, merchandise, events and workshops to promote their ethos. Books about radical times and events, history, LGBTQ rights and issues, sexual health and people of color are some of their preferred genre. A small and dedicated press in Portland, Microcosm was started as a music label by Joe Biel in 1996. The company knows how difficult it is for struggling and amateur writers to get a break so their website has very helpful and useful links and resources about writing and getting published. You can use their contact form to submit a manuscript of self-care, self-help, personal development or empowerment. The guidelines and contact form can be found here. An independent publisher in Oakland, New Harbinger Publications prints books about self-help, personal care and development, spirituality and psychology. Choosing authors with years of experience or personal knowledge about crucial issues like mindfulness, empowerment, health and wellness, they also publish resources for medical professionals. They print around 50 titles annually and have been in the business for nearly 35 years. New Harbinger is a traditional and medium sized publisher who encourages the author to be a part of the publishing process and story. Authors of self-help for parents, children, teachers or personal development can submit their manuscript after reading the guidelines. As a writer, Mike Smitley was tired of publishing companies discouraging and making the publishing process so challenging. He started Father’s Press to publish his book and soon realized there is a vital need for a publisher who empathizes with authors. A strong believer in Christian values and faith, Mike wants authors and stories to focus on the beliefs taught by Christianity. Self-help, history, religious studies, fiction, personal care and development using the Bible are some genres they publish. Writers are expected to follow the instructions listed on this page before submitting their manuscript for consideration. An independent publisher from 2011, Library Tales Publishing is a niche company. Printing only self-help, memoirs and selective fiction, they believe in the digital age of books. Their selection of unique voices and stories has enabled their books to top many bestseller lists in USA. Library Tales is a full service, traditional publisher who is seeking memorable and powerful storytelling in genres such as personal care, self-help or personal development. They have specified all their requirements on this page so interested writers can have a look. Use their form to create an account and submit your query. Higher Ground Books & Media are true to their name and want to print books that elevate us personally. Books about finding our true purpose, personal development and self-care are some of the topics they prefer. Whether it’s through true stories or experience or just sharing wisdom, their books offers readers and audiences a chance to better themselves. Religion, faith, spirituality, memoirs and wellness are some other topics they print. All those books revolve around the personal perspective of the author and writer. The submission guidelines and contact details are mentioned on their blog. HCI or Health Communications, Inc is one of the country’s most reputed non-fiction publishers. Known globally for their Chicken Soup for the Soul series, they have been in the business since 1977. Peter Vigso started this company in Deerfield to use stories and memoirs to improve the quality of lives of readers. Self-help, personal development, spirituality, diet, health, relationships, parenting and teen issues are just some of the topics they have previously printed. HCI is very insistent that the author or writer of self-help and personal development be an industry expert or trained professional. They also want positive, feel good stories that allow the reader to empower themselves and face challenges in a better manner. You can submit your manuscript via email or post after reading the guidelines here. Square One Publishers was launched in 2000 in New York. Rudy Shur, its founder felt the demand for a publisher of alternative health and care books. Over the years, Square One has expanded its horizons by printing and publishing books in self-help, parenting, travel, care, health, cooking, education, nature and personal development. It has been named the fastest growing independent book publisher in North America by Publishers Weekly for several years. Their dynamic team of professionals chooses and curate stories that give the readers a chance to learn and grow. Authors and writers are treated as a creative partner and their opinions are highly valued. A new and fresh take on personal development or self-help would be appreciated by Square One. Writers can read the submission guidelines and contact details on this page. A traditional publisher in Pennsylvania, Sunbury Press prints both fiction and non-fiction in digital and traditional formats. Publishing over 70 titles annually, this small company has found and printed quality books in history, self-help, personal development, horror, science fiction and mystery. Formed in 2004 by Lawrence Knorr, Sunbury Press has 6 imprints covering various topics and genres. You can only send electronic submissions to them using a Submittable form. The instructions to format your manuscript are listed on the above mentioned link. From 2008, The Experiment has been publishing books that inspire, motivate and challenge readers. Practical books with relevant and detailed information are their forte. You can find genres such as self-help, personal development, food, health, wellness, children’s books and fitness among their titles. Printing only non-fiction, The Experiment wants to cleanse the reader’s lives of any negativity, toxic energy or issues. Writers and authors are urged to share empowering, uplifting stories and ideas. Matthew Lore and Peter Burri started the company combining their experience in publishing and business to build something new. You can send a compact book proposal to the New York based publisher after reading their guidelines. Red Wheel or Weiser Books is known in America for its books on spiritualism, occult teachings and astrology from around the world. Located in Newburyport, they have various imprints that print and publish books on self-help, personal development and growth, recovery, relationships, meditation, life, tarot and fiction. Their goal is to find and print books that explore different avenues and invite the readers to change their existing and tired perspectives. Writers of personal development or self-help can send their manuscript via post or mail after reading the guidelines. Do you know of any other personal development book publishers? Please tell us more in the comments box below. Shikha Pandey is a creative, content and script writer based in Mumbai, India.